> Windows > Where Were You When Windows 95 Launched? 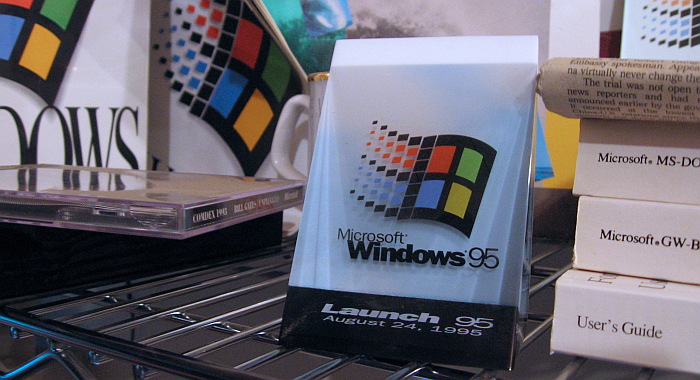 Where Were You When Windows 95 Launched? It is hard to believe Windows 95 launched twenty years ago, on August 24, 1995. Windows 95 changed everything—it gave us the Start menu and Internet Explorer, and introduced us to the Task Bar and Virtual Desktops. It was pretty groundbreaking stuff. Windows 95 made the operating system the rock star of the technology world. Remember the commercial with the Rolling Stones singing “Start Me Up”? Here is another Youtube blast from the past for you. People were so excited about Windows 95 back then. It has been a while since we felt like this about an operating system. Even Windows XP, arguably the most beloved Windows since, took a few years to grow a following, which many continue to follow even after end of support. Let’s not forget how much has changed since August 1995. Can you imagine driving out to big box retail store to buy an operating system which, incidentally, also came in a big box? Did we actually use a desktop PC without an Internet connection? And if we could connect, it was through a service called Prodigy? And when connected, we went to places like Usenet, where it was important not to forget your… netiquette. Ugh. Also, remember when people left their homes without any way to call, text, or connect to anyone else unless they physically crossed paths? How did we not lose our minds? Indeed, we live in different times. But the goal of modern operating systems remains the same. Bill Gates launched Windows 95 with the intent to harness the nascent Internet boom. And it did—with the help of 14.4k and 28.8k baud modems. Microsoft CEO Satya Nadella wants to do the same with Windows 10 twenty years after. The stated goal of Windows 10 is to provide a seamless, consistent portal to the Internet across every device. Nadella has the benefit of updated hardware, which, as we learned with Windows 8, also presents a huge challenge for software designers trying for cross-device consistency without offending the user. Like every operating system, Windows 10 will experience growing pains, but early reports feel more positive than with past Windows operating systems dating back to 1995. Can we call it “so far, so good” for Windows 10? I think so. Microsoft is looking to rekindle that 1995 enthusiasm with Windows 10. If that happens over the course of the next year, Windows 10 could be just as revolutionary. Windows 95 changed everything--it gave us the Start menu and Internet Explorer, and introduced us to the Task Bar and Virtual Desktops.